I'm turning 15 in on September 29th and for my Birthday i wanted to do something out of the house with some of my girlfriends. 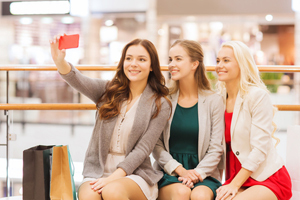 I love to go to the mall with my friends so I decided, why not, a mall scavenger hunt? The list consists of things like taking pictures in outrageous cloths, riding a kiddie ride, waving to random people, and a picture with a random cute guy, etc. I figured everyone should meet at my house before we head to the mall. I'm inviting 5 other girls, so there is 6 of us and so there is three people on every scavenger hunt team. Everyone is going to get a team shirt. There will be a black team and a pink team, and everyone will get a list I design for the scavenger hunt. Once everyone gets introduced and everyone has their team shirt, we will head to the mall. Also, on a side note, make sure all the members on every team get along; it would ruin everything if 2 or more of the girls don't get along. For the scavenger hunt, I figured I would make it into a fun competitive race, just so it feels more fun. After all, for 15 year old girls, playing a game just for fun isn't actually fun. I decided that I am going to tell everyone there is a prize, but I will not say the winning team will get it, I'll just there is a prize. No matter which team loses or wins, everyone will get a necklace. If you don't plan on splurging on the gifts for your friends, there is money saving substitutions. Instead of buying everyone a $30 necklace, you could go to a local drugstore and they will usually have a rack of jewelry for 3 or 4 dollars each, even less in some stores. I'm talking good jewelry, not plastic costume jewelry. After the scavenger hunt is over, we will compare our lists of what we did and did not complete, and everyone will get a prize. I made a reservation 7 months in advance at a restaurant. Ruby Tuesdays; where we are going to show up at 6 pm. Until then, after the scavenger hunt, we will take some time to actually do some shopping. A mall is not a mall without actual shoppers! After dinner we will head to my house for cake and open presents, plus play DDR3, and then everyone will go home with wonderful memories and new friends. Another side note: instead of eating out in a fancy restaurant, you could try a money saving alternative like ordering pizza or going out for ice cream, or even have a small dinner at home! Whatever you choose! I would guess, if you did everything the way I am going to do it, the budget would be 200-300 dollars for everything; if you want to save money, I'd say 50-150 dollars. Instead of buying customized shirts, I am getting plain colored shirts the girls will get to design on their own (another money saving idea).